Darth Sidious is a fast Jedi with anti-healing capabilities. Let’s take a look at what he has to offer to your team. Basic Ability: Deathstroke – Deal Physical damage to target enemy and inflict Healing Immunity for 3 turns. This attack has a 25% chance to ignore the target’s Armor. 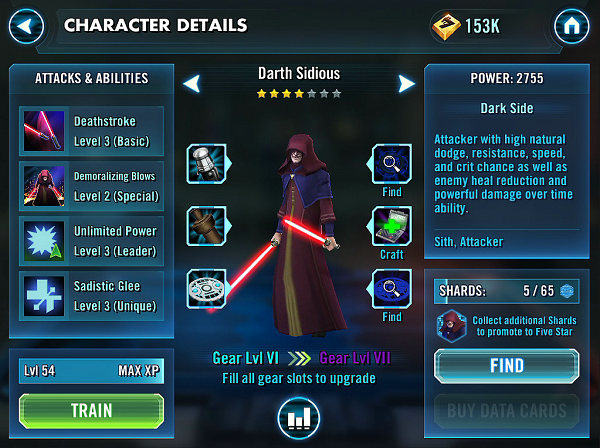 Unique Ability: Sadistic Glee – Darth Sidious recovers 20% of his Max Health whenever any unit is defeated, with a 25% chance to also gain 50% Turn Meter. In addition, he has +35% Evasion against Jedi attacks. Leader Skill: Unlimited Power – All allies gain 14% Critical Chance and 20% Critical Damage. Darth Sidious is a very good character in all stages of the game. 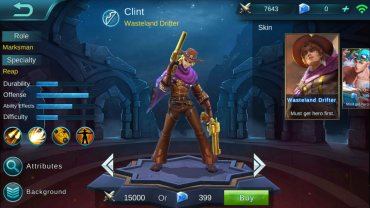 He is fast, he hits hard, he can apply anti healing debuff and deal damage over time to all enemies. He almost always goes first unless you meet Count Dooku or another Darth Sidious. Because of the anti-healing debuff, a heal heavy team will always be at a disadvantage as long as Sidious survives burst damage. Most healers are Jedis, so this will work to his advantage due to his 35% evasion against Jedis. His damage over time is also good against high health bosses and characters. If you use him as a leader, you can make all sorts of offensive oriented teams to go with him. The droids squad, critical hit based attackers, counter attackers are all viable with him as a leader. Since most characters will die at some point of the fight, he will always get “auto regen” unless he himself has the anti-heal debuff on him. He has a low health pool and is vulnerable to burst damage if you don’t gear him well. Other than that, this guy is a beast in the current meta.